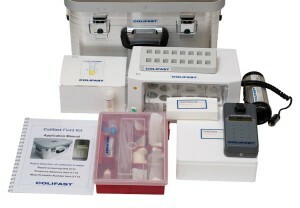 Colifast Field Kit is a portable tool for field detection of coliform bacteria in water. The main method of the kit is a rapid method that provides an answer as early as 15 minutes, 2 hours at the latest. In addition, the kit includes methods for a quantitative MPN (Most Probable Number) method and presence/absence results. The procedure is very easy to perform, and requires no laboratory skills. 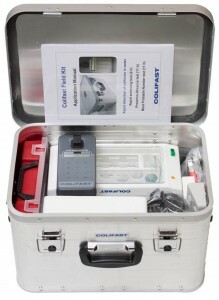 Colifast Field Kit is delivered in a robust and portable metal case, and all equipment required for the water analysis is included. 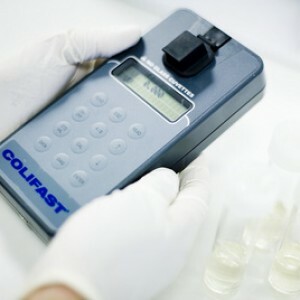 The Colifast Micro Detector (CMD) is used in combination with a growth medium for specific detection of target bacteria. Combined, they provide a simple instrumental analysis and rapid results that quantify the amount of coliform and thermotolerant bacteria in water. The method is based upon the patented technology of Colifast AS. The system detects down to 1 target bacterium per sample volume. The Colifast technology is based on a chemical reaction between a substrate in the growth medium and enzymes produced by the coliform bacteria. The bacterial enzyme β-D-galactosidase hydrolyses the substrate 4-methylumbelliferyl-β-D-galactoside, which results in the release of the fluorescent product 4-methylumbelliferone (MU). In addition to substrate, activators and growth factors, the medium comprises inhibitors that prevent the growth of non-coliform bacteria. The results are measured in fluorescent units. An increase in the number of bacteria corresponds to an increased amount of β-D-galactosidase (enzyme). The subsequent increase in the amount of MU (fluorescent product) results in a higher value on the instrument (Colifast Micro Detector). The incubation temperature selects for thermotolerant coliforms at 44 °C and total coliforms at 37 °C.